When we firsted started putting together the BC Road Trip Time Machine series, we thought they’d be interesting to share and a cool way to look back at our beautiful province 50 years ago. We’ve traveled from Duncan to Kelsey Bay, Hope to Revelstoke, the Malahat, over the Port Mann Bridge, from the U.S. border to Penticton, through Kelowna to Vernon, Chetwynd to Dawson Creek, Prince George to Mckenzie, and Nelson to Balfour. And there`s still more to come. We`ve had a blast sharing these with you…and it seems to have stirred up some of your memories. It was great seeing how much people enjoyed our videos, and the nostalgia they triggered, whether from traveling our highways themselves in 1966 or being a part of the communities the roads connected. The media thought the videos were worth sharing too. Thanks to CBC, Global, CFKC Today in Kamloops and others for putting a spotlight on our shared history. Now, a few individuals have strapped dashboard cams on their vehicles (not distracted driving) and drove the same routes as our time machine videos. 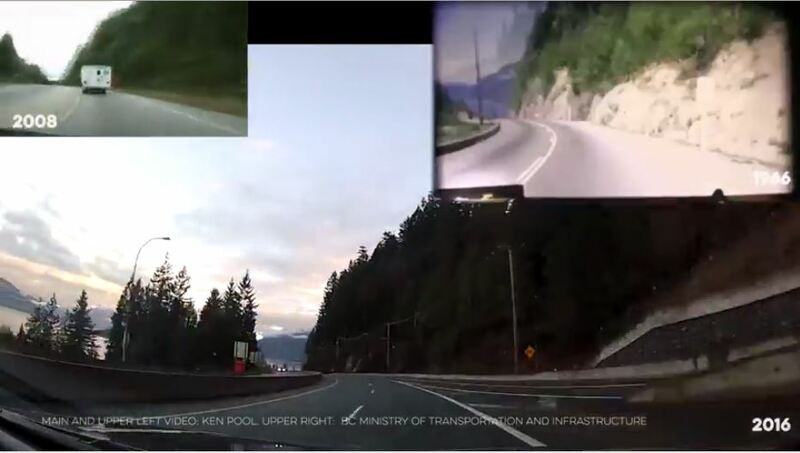 First, David Zille put together a side by side comparison of our 1966 video of Highway 16 versus today, 50 years later, from Prince Rupert to Terrace. And Ken Pool traveled the Sea to Sky Highway, combining 1966, 2008 and 2016. This is amazing to watch, seeing the transformation from then til now. How much has changed, how much we’ve grown and how much we love a BC road trip. We’re thrilled you’ve enjoyed our videos and we look forward to putting together more. Englishman River and Little Qualicum River Bridge in Highway 19A Need be Replacement. Is there something specifically about these bridges that you are concerned about? Nicely done merging of old and new! You can definitely catch the changes from ’66 to today with ease, well timed and matched up work here. Thanks for the feedback Ken! We are thrilled about this too.